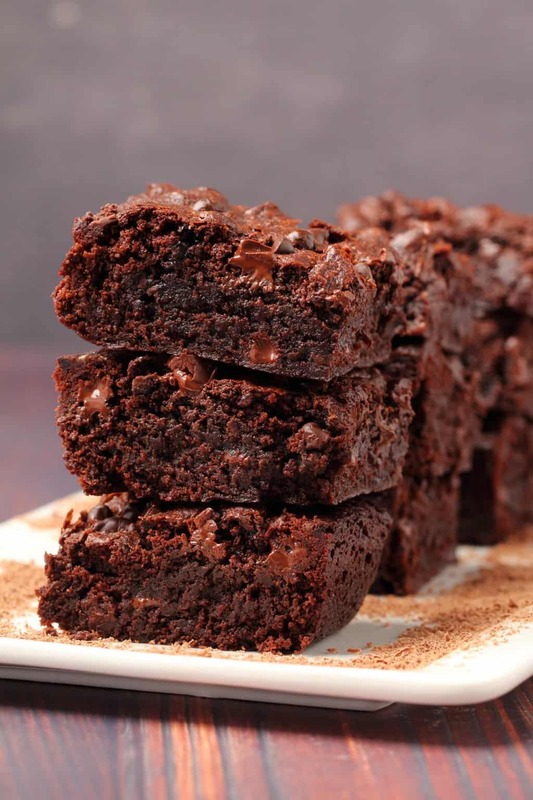 These vegan chocolate brownies are triple chocolate! And for all the chocoholics out there, this is for you! I’m a proud chocoholic myself so I feel I have a unique insight into what we want. All. The. Chocolate. Yes, all of it. 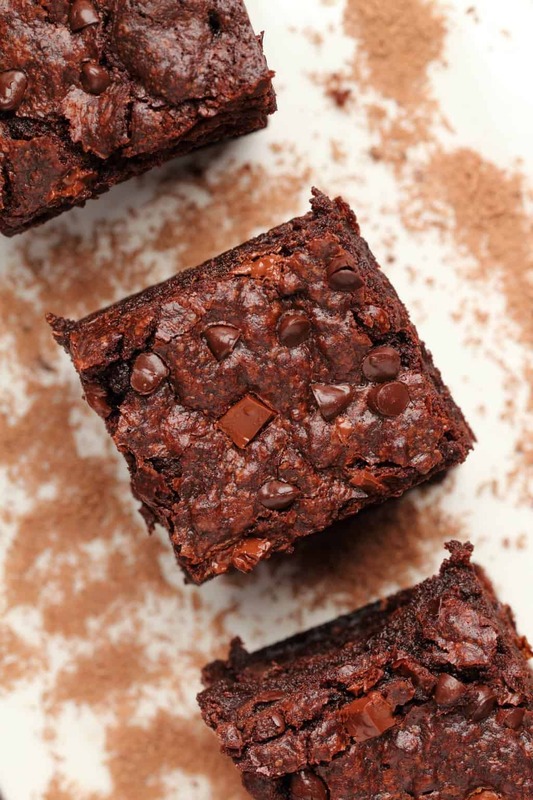 These vegan brownies have cocoa powder, melted chocolate and a mix of chocolate chunks and chocolate chips all mixed into the batter and then more chocolate chunks and chips sprinkled on top. 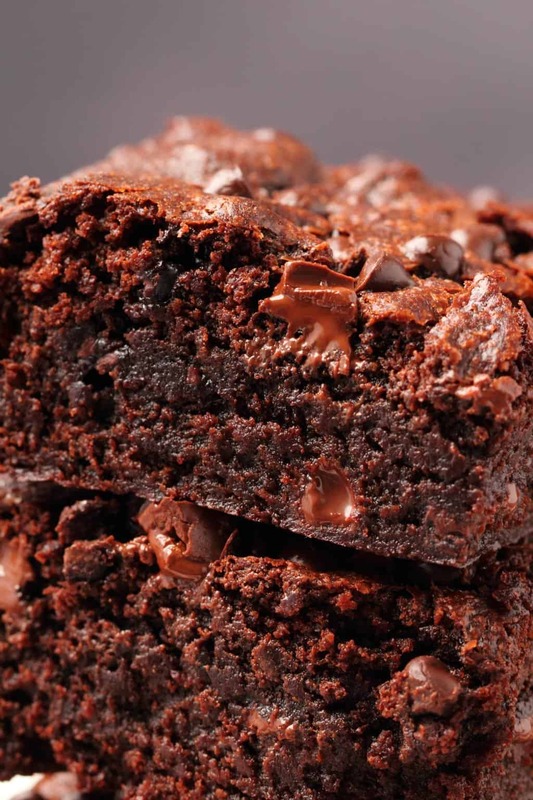 They are seriously fudgy, with so much chocolate flavor it’s like a dream come true. 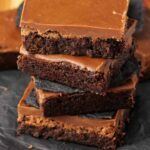 We adapted our basic recipe for simple vegan brownies to add heaps more chocolate for a super indulgent and decadent triple chocolate version. And oh my, it was a massive success. 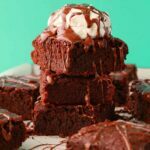 These vegan chocolate brownies are super easy to make! Sift flour and cocoa powder into a mixing bowl and then add brown and white sugar, baking powder, salt and instant coffee powder and mix it up. Then prepare some vegan buttermilk by mixing some lemon juice with some soy milk and allowing it to curdle. Add that into the mixing bowl along with some melted coconut oil and vanilla extract. Mix into a thick batter. Add melted vegan chocolate and fold in. Then add a mix of vegan chocolate chips and chunks and fold them in. Transfer to a 9×9 inch square baking dish and smooth down. 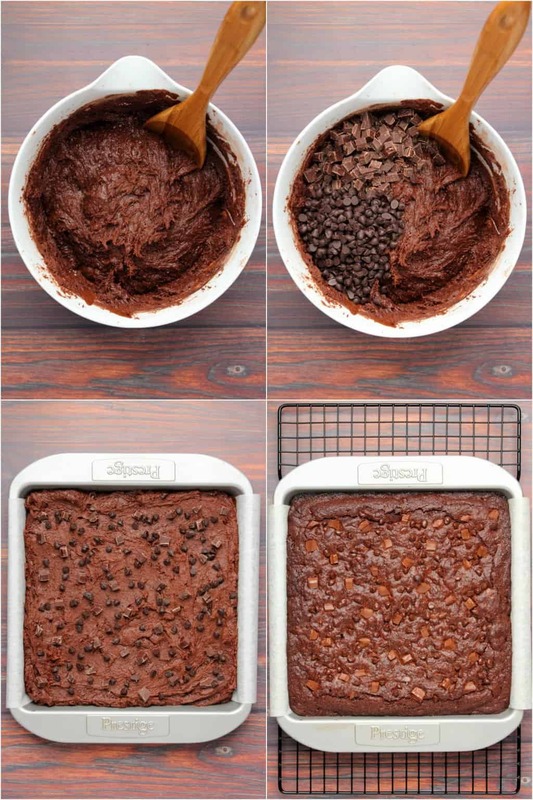 Top with more chocolate chunks and chocolate chips and then bake for 30-40 minutes (more on this point later). 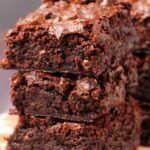 These vegan brownies are super fudgy and moist as you can hopefully see in the photos. 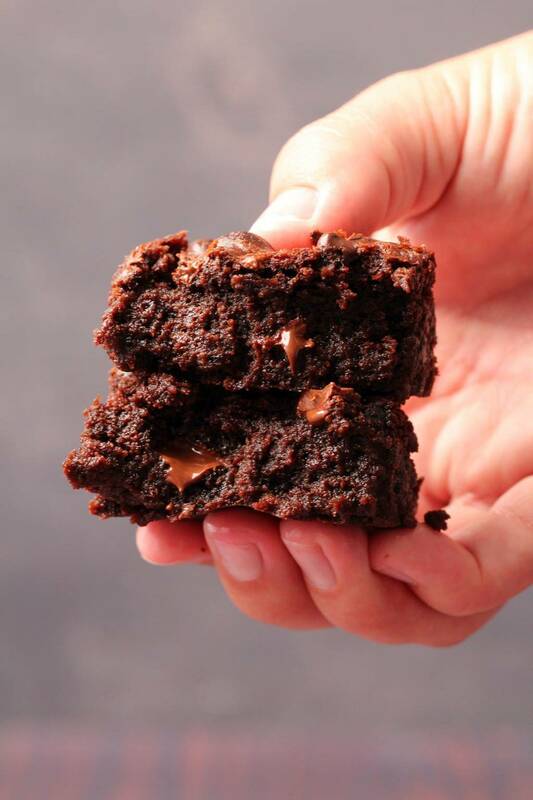 If you like your brownies ultra gooey you can make them like that too. All you have to do is cook them for less time. 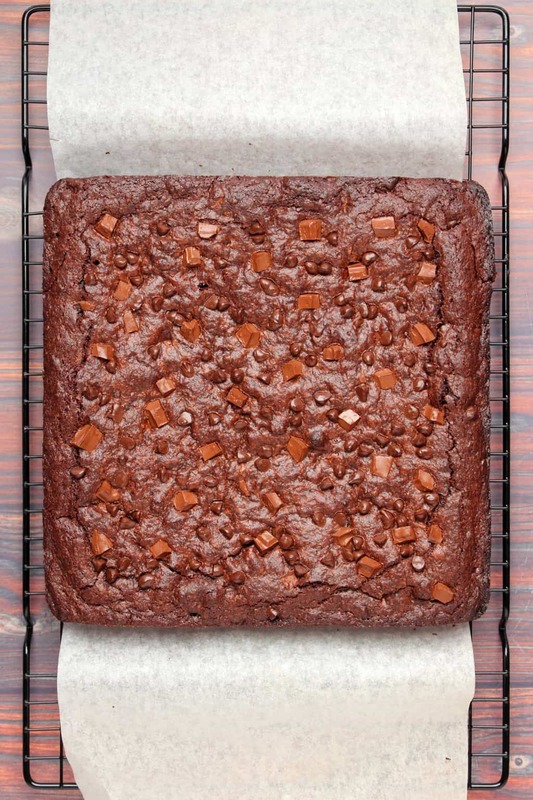 The brownies pictured were baked for 40 minutes. I tried a version where I baked them for only 30 minutes and they were so gooey! I know some people love them this way. 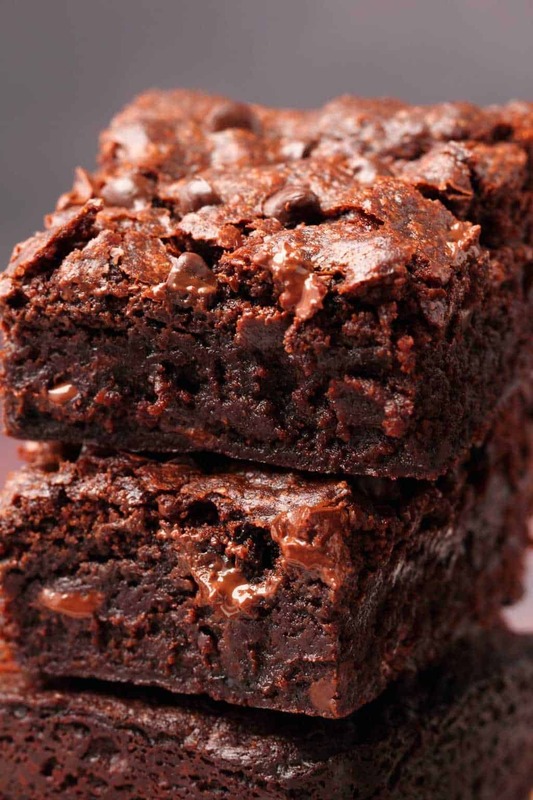 So if you’re a gooey brownie devotee feel free to bake these for a shorter time. I think the 40 minute baking time and the fudginess you can see in these photos is ideal but that’s my brownie preference. Make ’em how you like ’em. 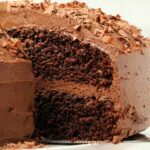 The combination of cocoa powder and melted chocolate create a wonderfully dense rich result here. Vegan buttermilk and coconut oil contribute to the dense fudginess. And we only use 1 tsp of baking powder in these brownies because we don’t want them to rise too much, we want them to be super dense. It’s not cake, it’s like pure chocolate! Can I skip the instant coffee powder? You can. 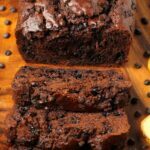 The coffee powder enhances the chocolate flavor, but it is an optional ingredient. You won’t taste the coffee at all in the final result, but if you don’t want to use it, you can omit it. However, if you can use it, it’s recommended. Can I make the vegan buttermilk with almond milk? Yes you can. I prefer soy milk for a richer result. But almond milk will work fine too. Can I use a different oil? Coconut oil works great and contributes to the really decadent fudgy texture, but yes, you can use a different vegetable oil without a negative impact. 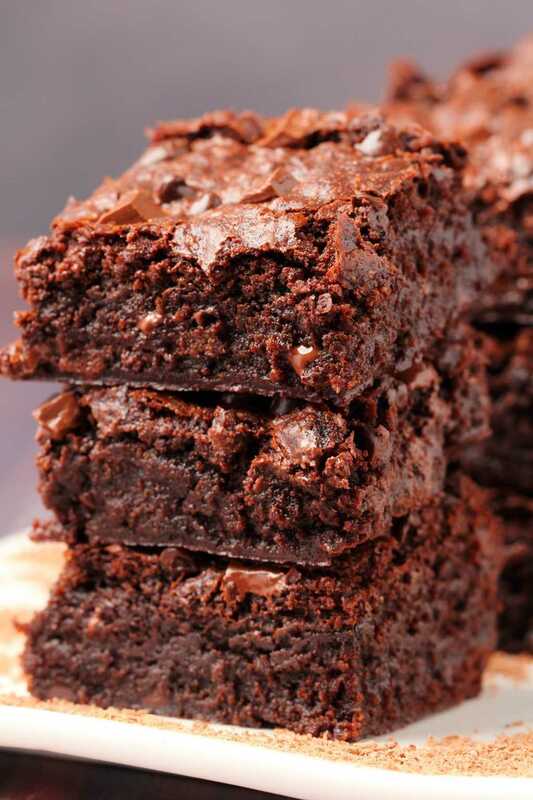 Can I make these brownies gluten-free? I reckon you can! This is so far an untested theory but I am pretty sure that if you use a gluten-free all purpose flour blend (don’t use a single type of flour, use an all purpose blend) then this should work great as a straight swap. 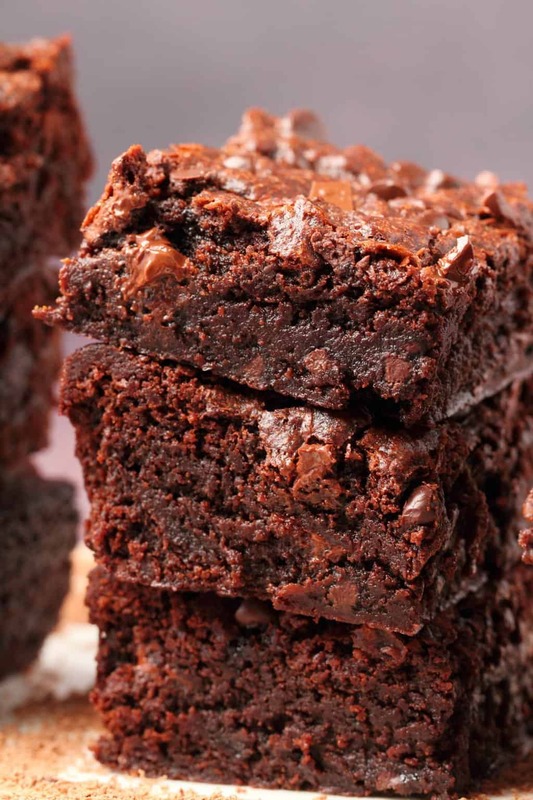 These brownies are so fudgy and moist that I don’t even necessarily think extra moisture is required to be added in. 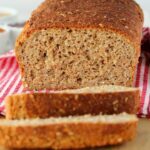 If they did end up a little on the drier side, then that would be because gluten-free flours tend to absorb more moisture than gluten containing flours, so if that happens then you’ll know to increase the oil – I would try increasing it by 1/3 cup – and perhaps adding in some applesauce as well. Can I freeze them? Yes you can! They freeze well for up to 3 months. 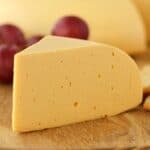 Keep them covered at room temperature where they will stay good for up to a week! Our Vegan Chocolate Fudge Cake also has melted chocolate folded into the batter and it’s rich and totally divine, so if these brownies are up your street, this cake will be too! 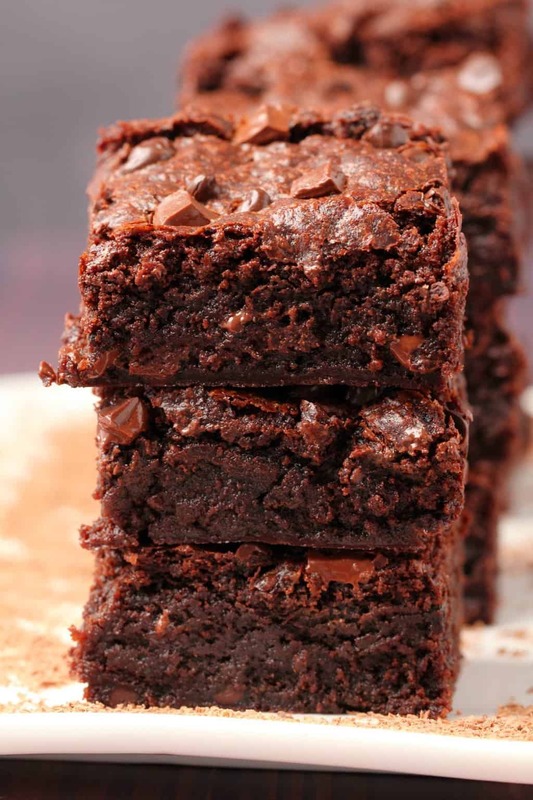 If you’re a brownie fan then these Vegan Zucchini Brownies won’t disappoint. They’re topped with a seriously delicious chocolate topping too. I actually got super arrogant and named this chocolate cake The Best Vegan Chocolate Cake and I mean what I say! Everyone who has tried this cake agrees it is the best. So….chocoholics, you know what to do. These Vegan Chocolate Truffles have a hard chocolate outside and a smooth and silky chocolate ganache center. A must try. 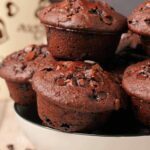 And when you’re in the mood for some chocolate cupcakes then you want this recipe for Classic Vegan Chocolate Cupcakes, fabulously delicious chocolate cupcakes topped with a rich and velvety vegan chocolate buttercream. These Vegan Chocolate Cookies are really double chocolate, a rich chocolate cookie packed with chocolate chips, what could be better? So let us know in the comments if you have any questions and what you think of this recipe! Please rate the recipe too, thanks! Sign up to our email list for more delicious recipes straight to your inbox. We’ll also send you a gorgeous (and free) recipe ebook with 10 delicious vegan dinner recipes. 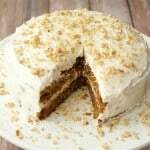 I really love your recipes and this one especially. Thank you. I am sorry I didn’t take a photo, maybe next time. Do you have any YouTube video for the same. Made these to take to a BBQ and was sceptical because every vegan dessert I try is never as good as the ‘real thing’. They were a massive hit, even my dairy loving husband is a fan and is on his second piece. I now can’t wait to try all your other desserts. 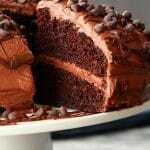 Thank you for giving me back chocolate cake!!! BUT THESE BROWNIES ARE THE BEST VEGAN BROWNIES I EVER HAD. I write it like this because I want to make sure everyone sees this comment! I will do this recipe forever. I just made two little changes: I used vegan margerine instead of oil because I didn’t had any coconut oil, and I put some hazelnuts in the batter. I prefer these brownies to non vegan brownie and everyone loved them, vegans and non vegans! Thank you so much. 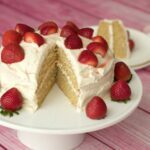 I think this is the only blog I trust in recipes before making them. 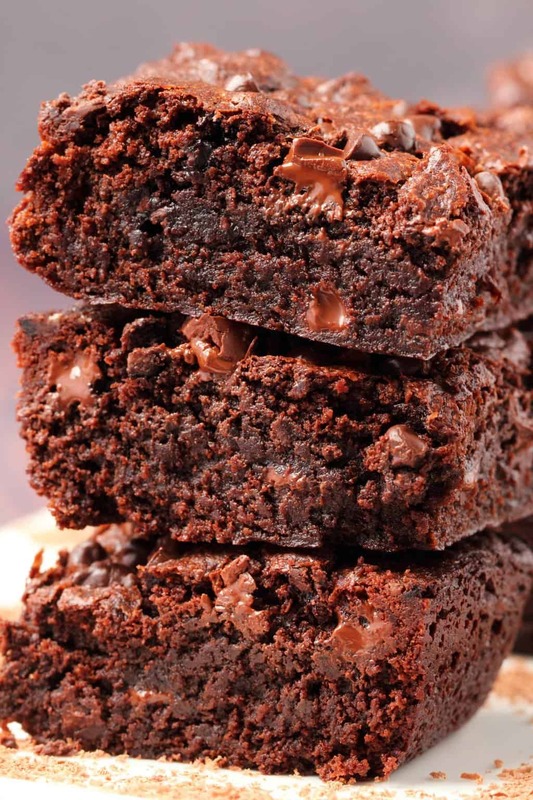 Super moist, super fudgy, super good and super recipe. Amazing. I made this recipe right after a different vegan brownie recipe that left me still craving for some proper brownies. These are proper brownies. So so delicious. I even replaced the coconut oil with sunflower and forgot the coffee! (I was bummed because I had made fresh espresso to put in) but they weren’t lacking at all. The only part that made the recipe slightly less convenient than I’d hoped is the melted chocolate. I might try omitting that next time just to see if they are still ok. If I were to reduce the oil a bit, do you think the apple sauce trick would work with these? If so what amount would you recommend?